Leaves of Grass is a poetry collection by the American poet Walt Whitman (1819–1892). Though the first edition was published in 1855, Whitman spent his entire life writing Leaves of Grass, revising it in several editions until his death. Among the poems in the collection are “Song of Myself”, “I Sing the Body Electric”, “Out of the Cradle Endlessly Rocking”, and in later editions, Whitman’s elegy to the assassinated President Abraham Lincoln, “When Lilacs Last in the Dooryard Bloom’d”. 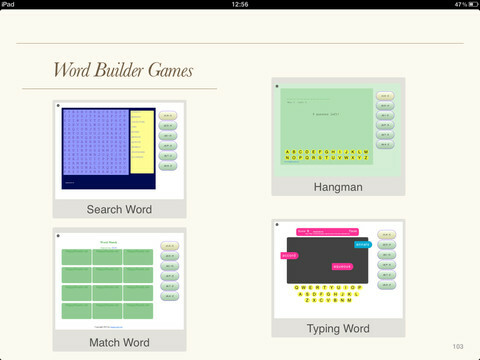 This e-book version contains word builder games which provides a completely new way to learn English vocabulary Fast and Fun! Start reading the original book and playing with the interactive word building games to master the vocabulary listed in this book. The vocabulary words you’ll find in this book are most frequently used words. By creating your own notes and study cards, you will be familiarized with the words that will help you learn to read better.